Marching is Healing. Come Join Us “Women’s March” Jan 21. In DC or Your Home Town! When I first heard about the Women’s March on Washington I wanted to participate. After Election Day I was in grief – veering from sadness to anger to depression. I kept hearing about the Women’s March, but felt it was too expensive for me to go. They are holding a march in Santa Cruz where I live, and in the Bay Area, but I wanted to be in the middle of a group of powerful, diverse women in Washington D.C. Magically I found that we could take a bus from New York to D.C. and attend. I have a great friend in New York, Steph, and she said she wanted to attend too. It took less than two hours to arrange. It felt like the angels were urging me on. Inexpensive airfare, decent price for the buses, housing help from Steph and help from GoFundMe. Yes, friends, old and new, men and women, donated to make it all possible. Truly a miracle for me. So off to New York and Washington D.C. I go. Holding all people in my heart. We shall overcome this illegitimate presidency. Soft rain today. 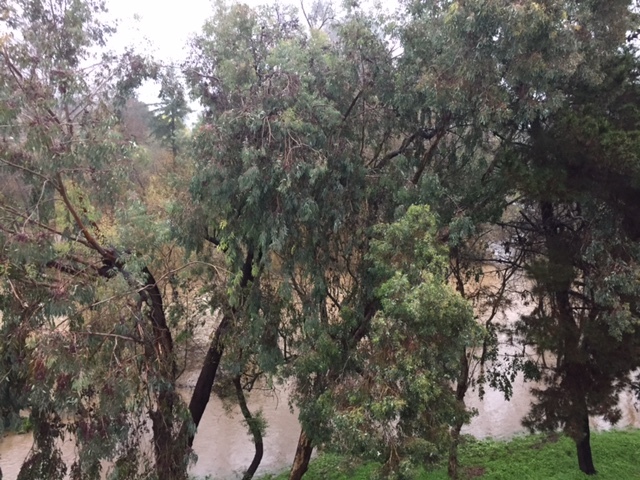 This is the San Lorenzo River outside my Tannery Arts Loft. It usually looks like a stream, but today it’s alive and swift. After the four year drought, it feels unusual to have a winter season. We are re-learning how to use umbrellas. Most of Santa Cruzans are out of their flip flops. It’s wet and green, and the mallards on the river are confused. How did the river get so full? Wishing you a wonderful January, 2017.